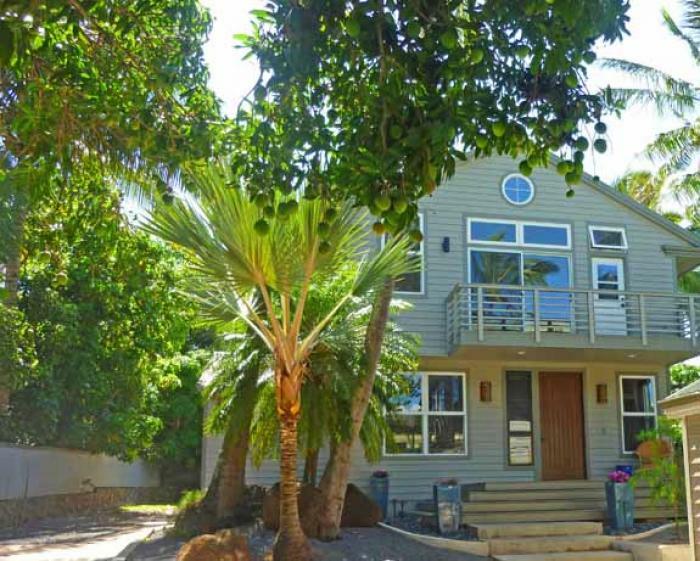 3 bedroom, 3 bath home located in the residential area of Spreckelsville, just a few minutes walk to the beach and a quick drive to Paia town with boutiques and fine restaurants.Looking for the beach? Baldwin Beach is right around the corner, a quick one minute walk down the street. This beach is "off-limits" to windsurfing and kitesurfing, and is the perfect beach for running, walking and swimming. One end of Baldwin Beach is known as "Baby Beach", and as the name implies is the preferred area for children. Other north shore beaches are within minutes by car: Spreckelsville Beach, Kanaha Beach, and Paia Bay. The swimming beaches of Kihei, Wailea and Makena are located on the South Shore, and will be approximately 30 to 45 minutes by car. The interior of Kahale Makani is modern and tastefully decorated. The gourmet kitchen has sub-zero fridge, granite counter tops, and quality appliances. The living areas have hardwood floors, and the bedrooms are carpeted. The main house shares a small property with the garage and cottage (cottage has a long term guest). Maximum occupancy is six guests (incl. children), and minimum stay is 7 nights (14 during Christmas season). Cleaning fee is $375. Security deposit of $1000 on credit card and rental agreement required. Three cars parking maximum. 13.42% taxes not included.